Ephesus pictures, photos of the library of Celsus & Images of the Roman ruins. 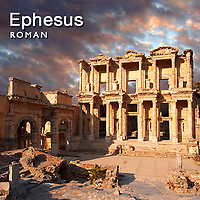 See & buy Ephesus stock photos or Ephesus photo art prints & cards. Ephesus ( Ephesos; Turkish Efes) was an ancient Greek city, and later a major Roman city, on the west coast of Asia Minor, near present-day Selçuk, Izmir Province, Turkey. It was one of the twelve cities of the Ionian League during the Classical Greek era. In the Roman period, it was for many years the second largest city of the Roman Empire; ranking behind Rome, the empire's capital. One of the landmark buildings of Ephesus is the library of Celsus. Completed in 135 AD by Celsus, son of Gaius Julius Aquila, the library of Celsus stored over 12,000 scrolls and was one of the great libraries of the ancient world. The library also served as a mausoleum for Celsus whose sarcophagus was buried below the library floor. The library of Celsus has become one of the iconic examples of Roman architecture. Ephesus is also linked with St Paul who lived in the city fro some time and wrote the Epistle to Ephesians while he was in prison in Rome (around 62 AD). Although St Paul was driven from Ephesus by its population who preferred their Pagan traditions to the new monotheistic Christian religion, Ephesus was probably an early strong hold of Christianity and St John may well have written his Gospel in Ephesus. Ephesus was one of the seven cities addressed in Revelation (Revelation 2:1–7), indicating that the church at Ephesus was strong.